A small town on the Mississippi River in the Arkansas Delta, Helena is home to one of the oldest and most remarkable Jewish communities in the state. Only seventy-five miles downriver from Memphis, this seat of Phillips County was founded in 1833. Due to its location on the river, Helena became a commercial center and steamboat port for the cotton-growing Arkansas Delta, and attracted a small Jewish community. Jews were in Helena by the 1840s; in 1846, a small group of Helena Jews borrowed a Torah from Cincinnati for the High Holidays. In the decade before the Civil War, the Jewish community in Helena continued to grow, as Jews from central Europe settled in towns along the Mississippi river. Many of these Jewish immigrants worked as traveling peddlers before settling in market towns like Helena. The 1870 U.S. Census indicates that most all of the Jewish residents of Helena were born in Prussia or other parts of what would soon be Germany. Most of the men owned dry goods stores or other retail establishments. In 1867, they founded a congregation, which they named Beth El (House of God). The 1860s was a crucial decade in the history of Helena’s Jewish community. Several Jewish immigrants settled in town during this time, including many families that would sink deep roots into this fertile land. Henry Fink came in 1862 and opened a large mercantile store in Helena. Aaron Meyers came in the 1860s, and started a wholesale and retail grocery business. Other important Jewish families like the Mundts and the Solomons first arrived in the 1860s. The Solomon family has been prominent in Helena ever since. Moses Solomon and his wife Pauline were the patriarch and matriarch of the family. When Pauline died in 1903, the family donated a playground to the city in her honor. They later bought a playground for the town’s black residents. Moses and Pauline’s children played an important role in Helena’s development. Joseph Solomon got involved in the grocery business, and later in the cotton industry. He eventually purchased a number of area farms and was instrumental in building the first concrete highway in the area, which connected Helena to the river crossing. Joseph also built a five-story office building in downtown, which was then the tallest structure in the area. His brother Phillip opened a department store that became the biggest in town. Their brother David Solomon worked with the department store and also grew spinach on his farmland. He later opened a clothing store called “The Leader” and started a wholesale dry goods operation with his brother Lafe. Many Helena Jews had retail stores. By 1880, Jews dominated the retail trade. In 1909, there were twenty-two Jewish owned businesses in town. Many of these merchants eventually got involved in the region’s staple crop, cotton. Pete Goldsmith became one of the largest cotton factors in the state. Harry Grauman owned a store in nearby Marvell, before opening the Grauman Cotton Company in Helena in 1909. His son Edward joined him in the business. Joseph Solomon also became a successful cotton broker. Jewish families from Eastern Europe came in the late 19th and early 20th centuries. Sam Ciener came from Hungary, and settled in Helena because his brother Joe was already living there. Sam became a successful men’s clothier, with his store The Stag. Jews have long played important civic roles in Helena. Aaron Meyers was elected tax collector, treasurer, and served as mayor from 1878 to 1880. He also served on the local school board. Jacob Fink, Henry’s son, was a local lawyer who served as mayor, judge, and school board member. David Solomon also spent time on the local school board. During the heyday of the Ku Klux Klan of the 1920s, he was challenged by a Klan-backed candidate, who was unable to defeat the popular Helena Jew. This tradition of Jewish office holding in Helena continued well into the twentieth century. Eli Newman served on the city council. Sam Ciener spent twelve years on the local school board; David Solomon Jr. was also on the school board. Leo Mundt and Ed Graumann, Jr. served as local judges. The most significant of these Jewish officeholders was Jacob Trieber, who was the first Jew ever appointed as a federal judge in the United States. Born in Polish Prussia, Trieber first settled in Helena in 1868, and become a well-respected lawyer and civic leader. He served as a city councilman, county treasurer, and a U.S. district attorney, before he was appointed a federal court judge by President William McKinley in 1900. 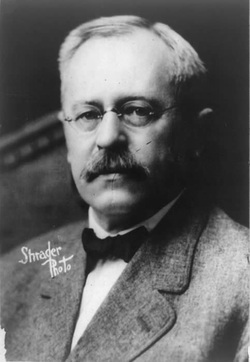 Although he was from the South, Trieber was very sympathetic to black citizens, ruling in one famous opinion that racial discrimination in hiring was unconstitutional. This forward thinking opinion in United States vs. Hodges was soon overturned by the U.S. Supreme Court in 1906. Trieber’s ideas would not become accepted by the federal judiciary for several more decades. As evidenced by Jacob Trieber and the long line of other Jewish officeholders, anti-Semitism was not a significant factor in the lives of most Helena Jews. Jews were always allowed to join the local country club. Jews socialized and became business partners with their Gentile neighbors. In 1903, the local newspaper described Helena’s Jews, writing: “in character, in wealth, and in influence, the Hebrews of Helena will compare favorably with those of any other city, large or small, in this country...they are almost to a man valuable citizens and upright gentlemen.” Jews were accepted and active in Helena’s civic life. Although they closely integrated into Helena society, Jews also worked to preserve their distinct identity. In addition to Temple Beth El, they also created several other Jewish organizations. Twenty-one local Jews formed a chapter of B’nai B’rith, a national Jewish fraternal and charity organization, in 1871. There also was a short-lived Young Men’s Hebrew Association and the Lotus Club, a social organization for Helena Jews, which continued even after the opening of the Helena Country Club. One particularly influential group was the Ladies Hebrew Benevolent Association, which was formed in 1875 to support those in financial need and soon became a major factor in the development of Temple Beth El. Helena was never a large Jewish community; its peak size was in 1927, when 400 Jews lived there. Since that point, the community has gradually diminished in size. The economy was heavily reliant on cotton; as cotton agriculture changed, Helena began to decline. Jews continued to own businesses into the 1970s and 1980s, but the congregation and the Jewish community shrunk as Jewish children raised in Helena did not return. In 2006, the few remaining members of the Helena Jewish community decided to close their synagogue and donate the building to the state for use as a community arts center, ensuring that the legacy of over 160 years of Jewish life in Helena will not be forgotten.